Healthy, light and delicious meal for brunch, lunch, dinner or snack on the go! 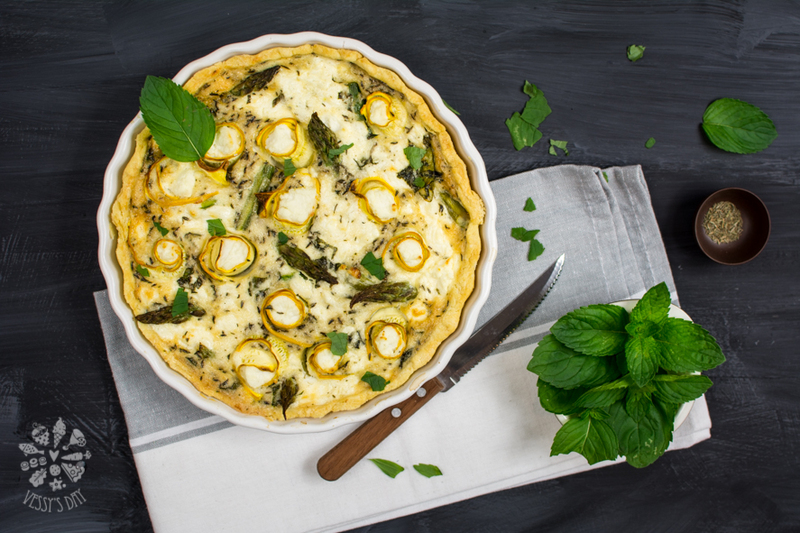 This quiche is filled with asparagus, zucchini, ricotta and fresh herbs. Combine flour and salt in a large bowl. Add the soften butter (chopped into small pieces) and start mixing with your hands and fingers (or in a food processor if you prefer) until the mixture resembles breadcrumbs. Add the egg yolk and knead until the dough comes together. If dough is too dry and doesn’t come together add one or two table spoons of water, one by one, until dough is wet enough to form a ball, but not too sticky. Shape dough into a disk, cover in plastic wrap and put in the fridge to firm up, about 30 minutes. Once firmed, roll the dough on a floured wooden board or on your counter. Gently fit in the rolled pastry in the greased pie dish, cover bottom and sides of the dish by pressing with your fingers and palms. 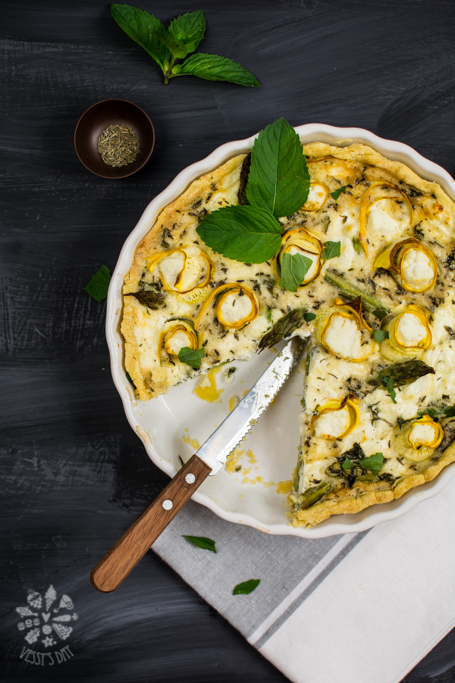 To make the filling: In a medium bowl combine eggs and cream and season with thyme, salt, pepper and mint. Pour the egg-cream mixture in the baking dish over the dough. Sprinkle the cheese, then add zucchini and asparagus. Season again with salt, pepper and mint. Preheat your oven to 170C fan-forced. Bake quiche for about 40 minutes. Let it cool off a bit before slicing it up.